Congratulations to the Lambeth Living Well Network Hub who won the Working Together Award – adult services in the NHS Lambeth Clinical Commissioning Group 2017 Lammy Awards. The awards (launched three years ago) recognise people who live and work in the borough who go the extra mile to provide exceptional health and care services. The Hub team, part of the Living Well Network was recognised for the ongoing work it has done to create, innovate and support those with mental health issues in Lambeth. As the ‘ front door’ to mental health services in the borough since 2013 (north Lambeth) and 2015, borough wide, it has played a significant role in bringing culture change to how mental health services are delivered, how teams work together and tackling people’s problems much earlier… preventative, person-centred in a primary setting. The nomination praised Former Programme Manager Emma Willing and now Stacey Hemphill, and Director Sue Field for leading and helping to launch an integrated and multi-disciplinary team, which links together primary care, social care, the voluntary sector and aspects of secondary care. This means that people get support much earlier, before they reach crisis point… This has meant a 43 per cent reduction in referrals to more costly secondary services (a mental health bed costing £450 a day) and also supports and enables people to find their own coping mechanisms. 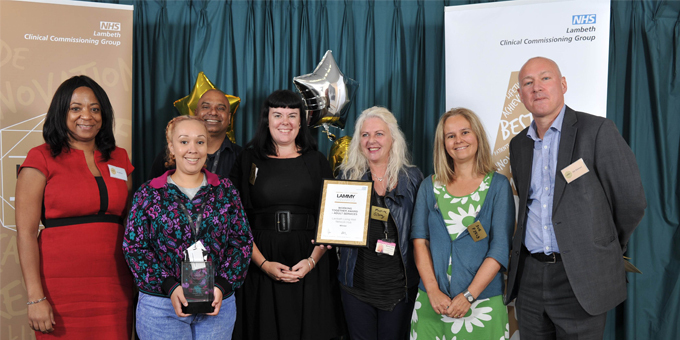 Pictured: Lead Sue Field (second right) and Manager Stacey Hemphill (centre) with team members Patrice Hollywood, Jason Alvares and Maxine Gilroy with Dr Di Aitken and Councillor Jim Dickson who presented the award. The theme that ran through the awards was recognition of the contribution of unpaid carers. This included the volunteers at King’s College Hospital NHS Foundation Trust who were recognised with the Kindness award for their contributions following the London Terror attacks and Grenfell Tower fire. The Carers4Carers organisation was recognised for their support for many unpaid carers in Lambeth, while Lambeth Young Carers won the Working Together Award – children’s services. The event took place during the CCG’s Annual General Meeting at the Kia Oval on Wednesday 6 September. The Certitude Community Choir, whose members include people with learning disabilities and mental health needs sang to 170 guests and winners. This year, special recognition was paid to the selfless contribution of staff from across local public services who were involved in helping people affected by the recent events at Westminster Bridge, London Bridge and Grenfell Tower. Lammy Awards were presented to local representatives of the ambulance service, hospital and mental health, fire service, the police and council teams to take back to their organisations to say thank you to their staff on the CCGs behalf. Dr McLachlan, said: “The impact of caring for people in these circumstances will stay with staff long after the events have ended. The courage and commitment shown in caring for patients and for each other has been exceptional.